I'm confused about lenses and numbers. Why are some lenses ex. 50mm-300mm Different sizes? Some lenses with the same mm numbers are huge and some are small... What's the difference? Also the prices differ. Some lenses are cheap and the same number mm lens is outrageous and the same size. One more question. What does the first set of mm numbers represent and what does the second (higher) number represent? Which lens is going to magnify something far away better? A 55mm-200mm or a 55mm-600mm? Simple beginner language works best. The focal length of the lens is the number given in millimeters. It basically describes the field of view of the lens and its magnification. Most folks think of shorter lenses as wide angle and longer lenses as telephoto, and certain subjects tend to lend themselves to one type of lens vs. another. (See: the Nikon lens simulator). When there are two numbers that means the lens is a zoom lens, where you can vary the focal length over a range. The first number is the wide end of the range, while the second number is the telephoto end of the range. See also: What do all those cryptic number and letter codes in a lens name mean? The camera lens acts like a projector lens. Its job is to project an image of the outside world on the surface of film or digital image sensor. The camera lens is a converging lens. Light from a far distant object enters the lens as parallel rays. The lens bends these rays inward so they trace out the shape of a cone. When we focus, we are adjusting lens to film/sensor distance so the apex of the cone just kisses the surface of film/sensor. We measure this distance, lens to film/sensor when the subject is at infinity (∞ as far as the eye can see). It is costmary to measure using the metric system, thus the millimeter is used. We label this distance the focal length. A 50mm lens means the lens to image distance is 50mm (about 2 inches) when the camera is imaging a distant subject. Short focal length lenses project tiny images and deliver a wide-angle view. Long focal length lenses project enlarged images; they are said to be telephoto. Lenses with variable focal lengths are called “zoom lenses”. The 50mm thru 300mm you mentioned is a zoom lens. What is “normal” is based on the size of the film/sensor. A full frame camera sports an image area that is about the same as the venerable 35mm film camera. This frame size measures 24mm height by 36mm length. A lens is considered to deliver a normal view if its focal length is about equal to the diagonal measurement of the frame. For the full frame this is about 45mm, however by tradition, we round this up to 50mm. For the smaller compact digital, the frame measures 16mm height by 24mm length. The normal focal length for this format is 30mm. Normal = about the same as the diagonal measure of the frame. The realm of telephoto is about 200% of normal and longer. As to what span or range of the zoom is best: Lenses are tools and some are better than others. Lenses with a large zoom span are difficult to make; thus good ones are very expensive. Suffice to say, you get what you pay for. Some lenses with the same mm numbers are huge and some are small... What's the difference? One big difference is the maximum aperture. 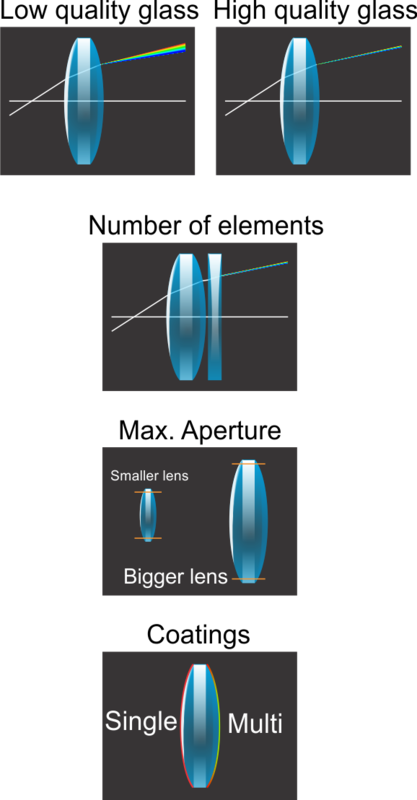 The f-number of a lens is determined by the focal length divided by the diameter of the "entrance pupil," i.e. the aperture as it appears from the front of the lens. To create a wider entrance pupil, you need a wider aperture and a larger lens. So, for example, a Canon EF 50mm f/1.2 lens is 3.4" in diameter whereas an EF 50mm f/1.8 is 2.7". The difference is more dramatic at longer focal lengths: an EF 200 f/2 is about 5" in diameter, whereas a EF 200 f/2.8 is about 3.3". Also the prices differ. Some lenses are cheap and the same number mm lens is outrageous and the same size. Many variables affect the cost of a lens. These include things like image quality, build quality (e.g. weather sealing, barrel material, etc. ), image stabilization, special materials like fluorite or special coatings, market size, etc. Most of us would probably prefer to carry the EF 200 f/2.8, which at $749 and 1.7 lbs is a lot more affordable and portable than the $5699, 5.6 lb EF 200 f/2. On the other hand, there are also photographers out there for whom the benefits of the f/2 lens outweigh the much larger cost, size, and weight. The bottom line is that different photographers have different needs: some have to work within a budget or want a lens that's easy to carry; others are happy to pay the price for a lens that's built better and/or is more capable. What does the first set of mm numbers represent and what does the second (higher) number represent? Which lens is going to magnify something far away better? A 55mm-200mm or a 55mm-600mm? Simple beginner language works best. The numbers measured in millimeters (mm) represent focal length. If there are two, they're the shortest and longest focal length of a zoom lens. The larger the number, the narrower the angle of view. On a full-frame DSLR, a 200mm lens will fill the frame with a view that's about 10° wide; a 600mm lens captures a view that's only around 3.4° wide. So, the 600mm lens makes a subject at the same distance seem larger than the 200mm lens does, and they're of course both the same at the 55mm end of the zoom range. On the other hand, a 55-600mm zoom lens would typically be a lot larger and heavier than a 55-200mm zoom. The measurement you refer to is most likely focal-length. A shorter focal-length gives a wide angle of view. Conversely a longer one gives a smaller angle-of-view. When a lens has a single number, the angle of view is mostly fixed. This is what we call a prime lens. When a lens has two numbers, we say it has a focal-range, which means it can take on any focal-length within the range. So, if the lens is a 50-200mm, then you can set it at any focal-length between 50 and 200. Not just whole numbers be really anything, could be 107.5mm if you like. Of course, only some focal-lengths are labelled, so you cannot be sure if you set it to 56 or 57mm. How far a lens sees is the wrong way to think about it. With very specialized exceptions, all lenses can focus until infinity. The right metric for how close you can magnify something is called magnification. Read this answer to a relevant question to understand how these relate. Taking your examples, the lens with a 600mm maximum focal-length has the smallest angle-of-view and therefore will magnify a distant object more. This type of lens is mostly used for bird and wildlife photography. For completness, you will sometimes encounter another measurement in mm on the lens which is the width of the filter-thread. This only dictates the diameter needed for a filter to mount directly on the lens instead of requiring an adapter-ring. Most lens have one but some lens do not, mostly on extreme wide ones such as fisheyes where any filter would obscure the angle-of-view partly. I agree with the other answers. However, they've failed to answer the question of why some lenses of the same length or range cost different amounts. Some of it is due to the quality of the glass. Depending on how a piece of glass is made and what it's made of, it may pass none, some, or (almost) all of the light that hits it to the sensor/film. Better glass costs more. There's also the construction of the lens. The quality of the rings used to focus the lens, the quality of the motors for autofocus, etc. The body of the lens may be plastic or metal. Usually metal is better quality. While we call a lens "a lens," it's really a series of pieces of glass (lenses) in most cases (particularly a zoom lens). The more glass in it, usually the more expensive it is. 1) What the mm means? The mm (milimeters) is a theorical distance from a point of the lens to the sensor (or film) plane. Imagine a pinhole camera obscura. 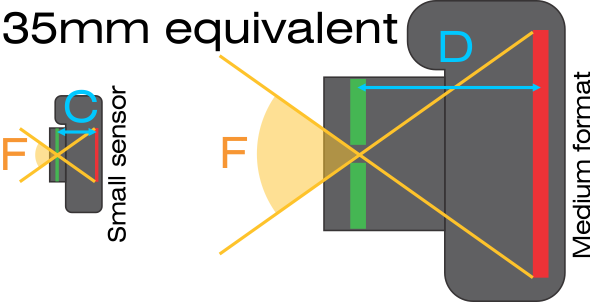 The distance from this pinhole to the back wall is the focal distance (A), which eventually defines the viewing angle (F). If you increase that distance (B) the angle of view is modified acordingly (G). In a pinhole camera the distance is exactly that, a phisical distance. On a glass lens this distance could not be exactly that becouse lens design, components etc. That is why I mention theorical. Do not confuse this 35mm with the previous one. On this case the most widley used camera were the 35mm film (phisical dimension of the wide part of the film) As this were the most popular, when the sensor is of a diferent dimension is common to define the angle of view as an equivalent to the 35mm film. In this case for example a 80mm lens could be equivalent in terms of the field of view on a big sensor or 15mm on a small sensor (F) remains the same. Glass quality. Some low quality have can produce dispersion, or chromathic aberrations. Number of elements Depending on the design, a "lens" can have diferent internal lenses to correct the light and give a better image. Max aperture The bigger the aperture the bigger the glass needed. Aditional things Like coatings, electronics, weather sealings, structural matherials etc. There are several factors than define a lens size. A denser glass refracts light more than a low density one. This means that the low density needs more distance to focus than the denser one for example. Lens elements, distances inside, etc. Inclusive some large telephoto lenses can be Reflective rather than Refractive, so they use internal mirrors to bounce the light inside and shorten the overall length of the lens. When a lens has a range (for example 70-300 mm) this means that has internal elements than can move back and foward and modify this focal length, therefore the field of view. Between this theorical lenses: 55mm-200mm or a 55mm-600mm The biggest number means a more powerfull telephoto. So a far object will look bigger. Not the answer you're looking for? Browse other questions tagged lens focal-length or ask your own question. Why do some lenses cost so much? How do zoom, magnification, and focal length relate? What's the practical difference in an image taken at focal length of 200mm vs 300mm? Will 18-55 and 55-200 lenses give me the same zoom abilities as a single 18-200 lens? What are the advantages and disadvantages of zoom lenses with a wide range of focal lengths? What is the difference between the Canon 55-250 IS II and 55-250 IS STM lenses?